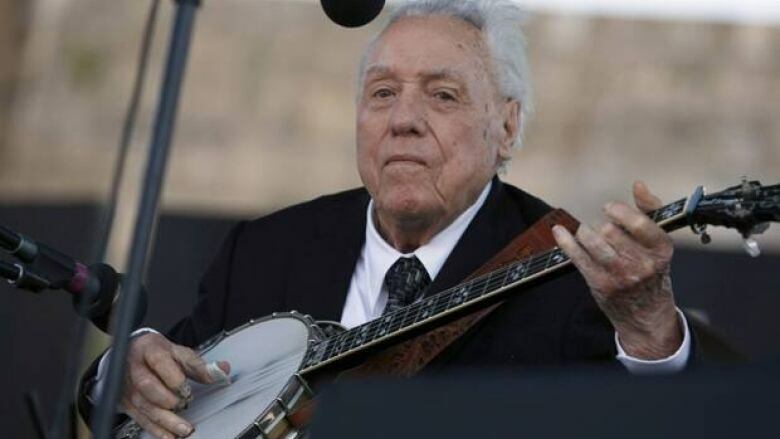 Bluegrass legend and banjo pioneer Earl Scruggs, who helped profoundly change country music with Bill Monroe in the 1940s and later with guitarist Lester Flatt, has died. He was 88. Scruggs's son Gary said his father died of natural causes Wednesday morning at a Nashville hospital. Earl Scruggs was an innovator who pioneered the modern banjo sound. His use of three fingers rather than the clawhammer style elevated the banjo from a part of the rhythm section — or a comedian's prop — to a lead instrument. His string-bending and lead runs became known worldwide as "the Scruggs picking style" and the versatility it allowed has helped popularize the banjo in almost every genre of music. The debut of Bill Monroe and the Blue Grass Boys during a post-Second World War performance on the Grand Ole Opry is thought of as the "big bang" moment for bluegrass and later 20th-century country music. Later, Flatt and Scruggs teamed as a bluegrass act after leaving Monroe from the late 1940s until breaking up in 1969 in a dispute over whether their music should experiment or stick to tradition. Flatt died in 1979. They were best known for their 1949 recording Foggy Mountain Breakdown, played in the 1967 movie Bonnie and Clyde, and The Ballad of Jed Clampett from The Beverly Hillbillies, the popular TV series that debuted in 1962. Jerry Scoggins did the singing. After the breakup, Scruggs used three of his sons in The Earl Scruggs Revue. The group played on bills with rock acts like Steppenwolf and James Taylor. Sometimes they played festivals before 40,000 people. In a July 2010 interview, Scruggs said in the early days, "I played guitar as much as I did the banjo, but for everyday picking I'd go back to the banjo. It just fit what I wanted to hear better than what I could do with the guitar." Scruggs will always be remembered for his willingness to innovate. In The Big Book of Bluegrass, Scruggs discussed the breakup with Flatt and how his need to experiment drove a rift between them. Later in 1985, he and Flatt were inducted together in the Country Music Hall of Fame. He said he enjoyed playing because "it calms me down. It makes me satisfied. Sometimes I just need to pick a few tunes." At an 80th birthday party for Scruggs in January 2004, country great Porter Wagoner said: "I always felt like Earl was to the five-string banjo what Babe Ruth was to baseball. He is the best there ever was, and the best there ever will be." In 2005, Foggy Mountain Breakdown was selected for the Library of Congress's National Recording Registry of works of unusual merit. The following year, the 1972 Nitty Gritty Dirt Band's Will the Circle Be Unbroken, on which Scruggs was one of many famous guest performers, joined the list, too. Scruggs had been fairly active in the 2000s, returning to a limited touring schedule after frail health in the 1990s. In 1996, Scruggs suffered a heart attack in the recovery room of a hospital shortly after hip-replacement surgery. He also was hospitalized late last year, but seemed in good health during a few appearances with his sons in 2010 and 2011. In 2001 he released a CD, Earl Scruggs and Friends, his first album in a decade and an extension of The Earl Scruggs Revue. Over 12 songs, he collaborated with an impressive stable of admirers: Elton John, Dwight Yoakam, Travis Tritt, Sting, Melissa Etheridge, Vince Gill, John Fogerty, Don Henley, Johnny Cash and actor Steve Martin, a banjo player, were all featured. Scruggs, born Jan. 6, 1924, in Flint Hill, N.C., learned to play banjo at age four. He appeared at age 11 on a radio talent scout show. By age 15, he was playing in bluegrass bands. "My music came up from the soil of North Carolina," Scruggs said in 1996 when he was honoured with a heritage award from his home state. He and Flatt played together in Bill Monroe's Blue Grass Boys, then left to form the Foggy Mountain Boys in 1948. Their popularity grew, and they even became a focal point of the folk music revival on college campuses in the late 1950s and early 1960s. Scruggs's wife, Louise, was their manager and was credited with cannily guiding their career as well as boosting interest in country music. In the 1982 interview, Scruggs said Bonnie and Clyde and The Beverly Hillbillies broadened the scope of bluegrass and country music "more than anything I can put my finger on. Both were hits in so many countries." Scruggs also wrote an instructional book, Earl Scruggs and the Five String Banjo. In 1992, Scruggs was among 13 recipients of a National Medal of Art. "I never in my wildest dreams thought of rewards and presentations," he said. "I appreciate those things, especially this one." Louise Scruggs, his wife of 57 years, died in 2006. He is survived by two sons, Gary and Randy. Gary Scruggs says funeral arrangements are incomplete.